"We make a determined attempt to teach not just a series of techniques but a coherent approach designed to promote not just competence but excellence in yacht design." Two year course for both non-residential and residential students proceeding at their own pace with total tuition less than $2000. 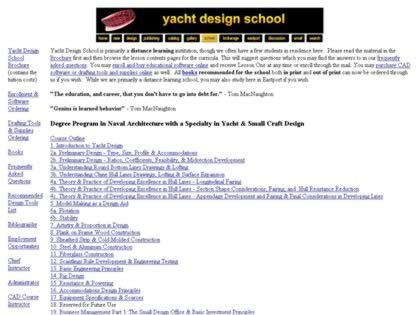 Web Site Snapshot: If available, above is a snapshot of the Macnaugtongroup Yacht Design School web site at http://www.macnaughtongroup.com/school.htm as it appeared when this site was added to the directory or last verified. Please Note that Boat Design Net has no involvement with the above web site; all content and images depicted in the above thumbnail are the property and copyright of Macnaugtongroup Yacht Design School unless otherwise noted on that site. Description: "We make a determined attempt to teach not just a series of techniques but a coherent approach designed to promote not just competence but excellence in yacht design." Two year course for both non-residential and residential students proceeding at their own pace with total tuition less than $2000.